Identifying apple varieties can be notoriously difficult, even for the experts. But with recent developments in DNA analysis, it is now possible to do this with almost 100% accuracy. East Malling Research has completed the DNA analysis of all 2,200 apple varieties growing at the National Fruit Collection at Brogdale in Kent. For a modest fee, they can now provide a DNA fingerprint of samples sent in to them, and match them against their apple DNA database. If it matches a tree in the National Collection, then this is identified. If it is not in the Collection, then your apple is an unknown variety. The Community Orchard has found a number of interesting apples in the district that have proved difficult to identify, and so we submitted these for testing last summer. One was from the garden of an old house in Steyning High Street. 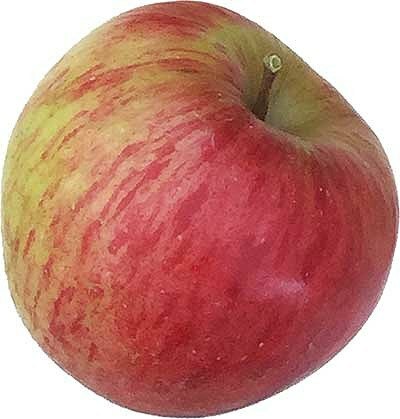 It was identified as Cockle Pippin, an old apple dating from 1800 that used to be widely grown in Sussex and Surrey. This is the first tree of this variety that we know of in Steyning. One is an old apple tree in our Orchard on the Memorial Playing Field. It has smallish yellow sharp apples (good for juice/cider), and flowers later than any other variety that we know of, thus avoiding very late frosts. This characteristic could have national importance in any future apple breeding programmes, so is worth preserving for this reason alone. The other tree is growing alongside the old Steyning railway line, probably growing from the seeds in a discarded apple core thrown from a railway carriage. The apples are a good size, attractively coloured, crunchy and juicy with white flesh, and have a good flavour. It is very rare for a tree growing from a discarded core to have useful apples on it. They mostly produce sour crab apples. At present they both exist as single trees, so we will be doing lots of grafting this winter to add to their numbers. We hope that we can get the Steyning Scarlet widely planted around the district in the coming years, and to be able to sell these trees at our future events. If you would like to register your interest in having a Steyning Scarlet of your own, please email steyningorchard@gmail.com and we will provide you with more details.